Lanka Ashok Leyland PLC offers regular programs for customer representatives on Product Familiarization, Trouble-shooting, Driving techniques, Maintenance & Overhaul, covering the entire product range. Lanka Ashok Leyland PLC has a full fledged modern training center at Panagoda, Homagama offering regular programs for customer representatives on Product Familiarization, Trouble-shooting, Driving techniques, Maintenance & Overhaul, covering the entire product range. 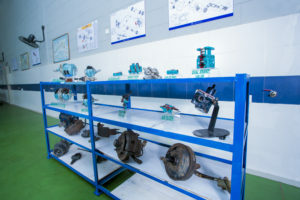 The Service training center is fully equipped with aggregates, Cut-section models, general and special tools, advanced multimedia facilities, Video Conferencing facilities, technical handouts and the equipment needed for training. Experienced in-house faculty, experts from the proprietary manufacturers handle the training programs. We also give training to technicians from various technical institutions. Lanka Ashok Leyland PLC conducts 2 year NVQ-Level 4 program, in collaboration with Dayalbagh Educational Institute.